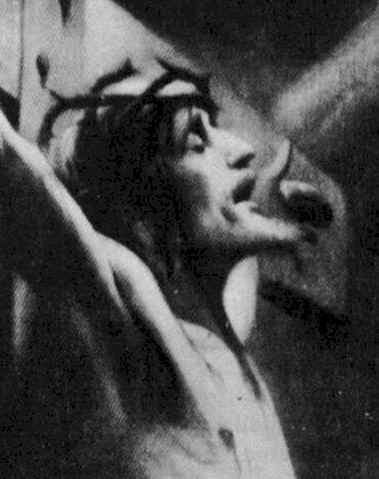 Christ Crucified as seen in vision by Venerable Anne Catherine Emmerich, from the work entitled THE DOLOROUS PASSION OF OUR LORD JESUS CHRIST , as recorded in the journals of Clemens Brentano. THE preparations for the crucifixion being finished four archers went to the cave where they had confined our Lord and dragged him out with their usual brutality, while the mob looked on and made use of insulting language, and the Roman soldiers regarded all with indifference, and thought of nothing but maintaining order. When Jesus was again brought forth, the holy women gave a man some money, and begged him to pay the archers anything they might demand if they would allow Jesus to drink the wine which Veronica had prepared; but the cruel executioners, instead of giving it to Jesus, drank it themselves. They had brought two vases with them, one of which contained vinegar and gall, and the other a mixture which looked like wine mixed with myrrh and absinthe; they offered a glass of the latter to our Lord, which he tasted, but would not drink. There were eighteen archers on the platform; the six who had scourged Jesus, the four who had conducted him to Calvary, the two who held the ropes which supported the cross, and six others who came for the purpose of crucifying him. They were strangers in the pay of either the Jews or the Romans; and were short thick-set men, with most ferocious countenances, rather resembling wild beasts than human beings, and employing themselves alternately in drinking and in making preparations for the crucifixion. This scene was rendered the more frightful to me by the sight of demons, who were invisible to others, and I saw large bodies of evil spirits under the forms of toads, serpents, sharp-clawed dragons, and venomous insects, urging these wicked men to still greater cruelty, and perfectly darkening the air. They crept into the mouths and into the hearts of the assistants, sat upon their shoulders, filled their minds with wicked images, and incited them to revile and insult our Lord with still greater brutality. Weeping angels, however, stood around Jesus, and the sight of their tears consoled me not a little, and they were accompanied by little angels of glory, whose heads alone I saw. There were likewise angels of pity and angels of consolation among them; the latter frequently approached the Blessed Virgin and the rest of the pious persons who were assembled there, and whispered words of comfort which enabled them to bear up with firmness. The executioners soon pulled off our Lord’s cloak, the belt to which the ropes were fastened, and his own belt, when they found it was impossible to drag the woollen garment which his Mother had woven for him over his head, on account of the crown of thorns; they tore off this most painful crown, thus reopening every wound, and seizing the garment, tore it mercilessly over his bleeding and wounded head. Our dear Lord and Saviour then stood before his cruel enemies, stripped of all save the short scapular which was on his shoulders, and the linen which girded his loins. His scapular was of wool; the wool had stuck to the wounds, and indescribable was the agony of pain he suffered when they pulled it roughly off. He shook like the aspen as he stood before them, for he was so weakened from suffering and loss of blood that he could not support himself for more than a few moments; he was covered with open wounds, and his shoulders and back were torn to the bone by the dreadful scourging he had endured. 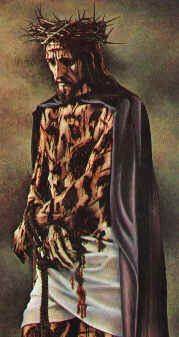 He was about to fall when the executioners, fearing that he might die, and thus deprive them of the barbarous pleasure of crucifying him, led him to a large stone and placed him roughly down upon it, but no sooner was he seated than they aggravated his sufferings by putting the crown of thorns again upon his head. They then offered him some vinegar and gall, from which, however, he turned away in silence. The executioners did not allow him to rest long, but bade him rise and place himself on the cross that they might nail him to it. Then seizing his right arm they dragged it to the hole prepared for the nail, and having tied it tightly down with a cord, one of them knelt upon his sacred chest, a second held his hand flat,and a third taking a long thick nail, pressed it on the open palm of that adorable hand, which had ever been open to bestow blessings and favours on the ungrateful Jews, and with a great iron hammer drove it through the flesh, and far into the wood of the cross. Our Lord uttered one deep but suppressed groan, and his blood gushed forth andsprinkled the arms of the archers. I counted the blows of the hammer, but my extreme grief made me forget their number. The nails were very large, the heads about the size of a crown piece, and the thickness that of a man’s thumb, while the points came through at the back of the cross. The Blessed Virgin stood motionless; from time to time you might distinguish her plaintive moans; she appeared as if almost fainting from grief, and Magdalen was quite beside herself. When the executioners had nailed the right hand of our Lord, they perceived that his left hand did not reach the hole they had bored to receive the nail, therefore they tied ropes to his left arm, and having steadied their feet against the cross, pulled the left hand violently until it reached the place prepared for it. This dreadful process caused our Lord indescribable agony, his breast heaved, and his legs were quite contracted. They again knelt upon him, tied down his arms, and drove the second nail into his left hand; his blood flowed afresh, and his feeble groans were once more heard between the blows of the hammer, but nothing could move the hard-hearted executioners to the slightest pity. The arms of Jesus, thus unnaturally stretched out, no longer covered the arms of the cross, which were sloped; there was a wide space between them and his armpits. Each additional torture and insult inflicted on our Lord caused a fresh pang in the heart of his Blessed Mother; she became white as a corpse, but as the Pharisees endeavoured to increase her pain by insulting words and gestures, the disciples led her to a group of pious women who were standing a little farther off. The executioners had fastened a piece of wood at the lower part of the cross under where the feet of Jesus would be nailed, that thus the weight of his body might not rest upon the wounds of his hands, as also to prevent the bones of his feet from being broken when nailed to the cross. A hole had been pierced in this wood to receive the nail when driven through his feet, and there was likewise a little hollow place for his heels These precautions were taken lest his wounds should be torn open by the weight of his body, and death ensue before he had suffered all the tortures which they hoped to see him endure. The whole body of our Lord had been dragged upward, and contracted by the violent manner with which the executioners had stretched out his arms, and his knees were bent up; they therefore flattened and tied them down tightly with cords; but soon perceiving that his feet did not reach the bit of wood which was placed for them to rest upon, they became infuriated. Some of their number proposed making fresh holes for the nails which pierced his hands, as there would be considerable difficulty in removing the bit of wood, but the others would do nothing of the sort, and continued to vociferate, ‘He will not stretch himself out, but we will help him;’ they accompanied these words with the most fearful oaths and imprecations, and having fastened a rope to his right leg, dragged it violently until it reached the wood, and then tied it down as tightly as possible. The agony which Jesus suffered from this violent tension was indescribable; the words ‘My God, my God,’ escaped his lips, and the executioners increased his pain by tying his chest and arms to the cross, lest the hands should be torn from the nails. They then fastened his left foot on to his right foot, having first bored a hole through them with a species of piercer, because they could not be placed in such a position as to be nailed together at once. Next they took a very long nail and drove it completely through both feet into the cross below, which operation was more than usually painful, on account of his body being so unnaturally stretched out; I counted at least six and thirty blows of the hammer. During the whole time of the crucifixion our Lord never ceased praying, and repeating those passages in the Psalms which he was then accompanying, although from time to time a feeble moan caused by excess of suffering might be heard. In this manner he had prayed when carrying his cross, and thus he continued to pray until his death. I heard him repeat all these prophecies; I repeated them after him, and I have often since noted the different passages when reading the Psalms, but I now feel so exhausted with grief that I cannot at all connect them. When the crucifixion of Jesus was finished, the commander of the Roman soldiers ordered Pilate’s inscription. to be nailed on the top of the cross. The Pharisees were much incensed at this, and their anger was increased by the jeers of the Roman soldiers, who pointed at their crucified king; they therefore hastened back to Jerusalem, determined to use their best endeavours to persuade the governor to allow them to substitute another inscription. It was about a quarter past twelve when Jesus was crucified; and at the moment the cross was lifted up, the Temple resounded with the blast of trumpets, which were always blown to announce the sacrifice of the Paschal Lamb. 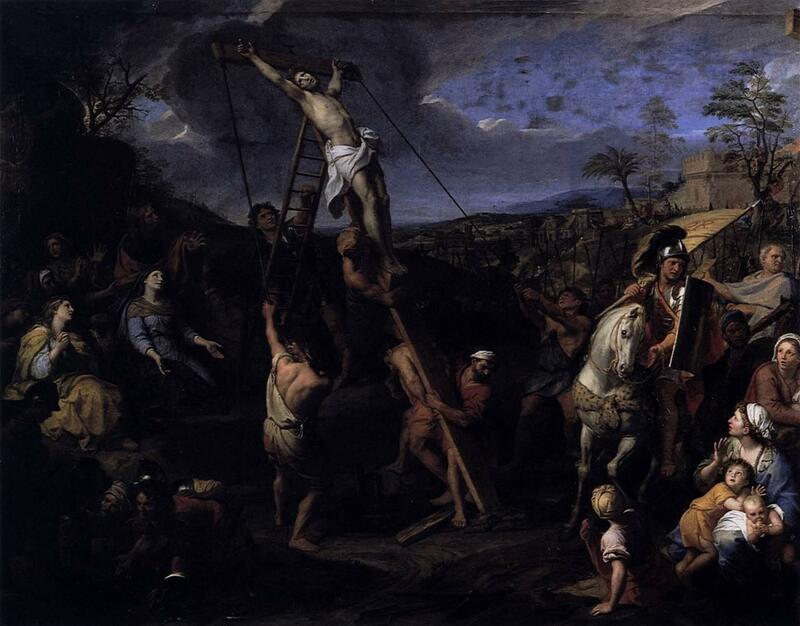 WHEN the executioners had finished the crucifixion of our Lord, they tied ropes to the trunk of the cross, and fastened the ends of these ropes round a long beam which was fixed firmly in the ground at a little distance, and by means of these ropes they raised the cross. Some of their number supported it while others shoved its foot towards the hole prepared for its reception—the heavy cross fell into this hole with a frightful shock—Jesus uttered a faint cry, and his wounds were torn open in the most fearful manner, his blood again burst forth, and his half dislocated bones knocked one against the other. The archers pushed the cross to get it thoroughly into the hole, and caused it to vibrate still more by planting five stakes around to support it. A terrible, but at the same time a touching sight it was to behold the cross raised up in the midst of the vast concourse of persons who were assembled all around; not only insulting soldiers, proud Pharisees, and the brutal Jewish mob were there, but likewise strangers from all parts. The air resounded with acclamations and derisive cries when they beheld it towering on high, and after vibrating for a moment in the air, fall with a heavy crash into the hole cut for it in the rock. But words of love and compassion resounded through the air at the same moment; and need we say that these words, these sounds, were emitted by the most saintly of human beings—Mary— John—the holy women, and all who were pure of heart? They bowed down and adored the ‘Word made flesh,’ nailed to the cross; they stretched forth their hands as if desirous of giving assistance to the Holy of Holies, whom they beheld nailed to a cross and in the power of his furious enemies. But when the solemn sound of the fall of the cross into the hole prepared for it in the rock was heard, a dead silence ensued, every heart was filled with an undefinable feeling of awe—a feeling never before experienced, and for which no one could account, even to himself; all the inmates of hell shook with terror, and vented their rage by endeavouring to stimulate the enemies of Jesus to still greater fury and brutality; the souls in Limbo were filled with joy and hope, for the sound was to them a harbinger of happiness, the prelude to the appearance of their Deliverer. 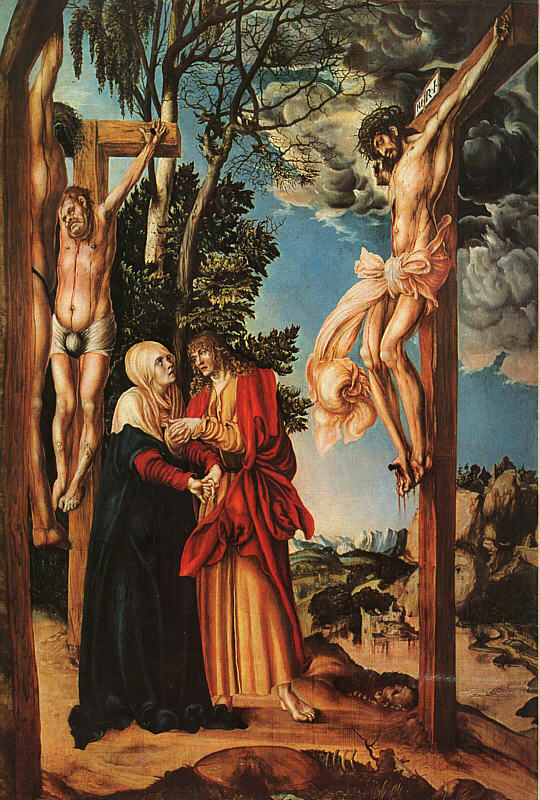 Thus was the blessed cross of our Lord planted for the first time on the earth; and well might it be compared to the tree of life in Paradise, for the wounds of Jesus were as sacred fountains, from which flowed four rivers destined both to purify the world from the curse of sin, and to give it fertility, so as to produce fruit unto salvation. The eminence on which the cross was planted was about two feet higher than the surrounding parts; the feet of Jesus were sufficiently near the ground for his friends to be able to reach to kiss them, and his face was turned to the north-west.